Few things are as difficult in the modern world as fasting. It is not simply the action of changing our eating habits that we find problematic – it’s the whole concept of fasting and what it truly entails. It comes from another world. We understand dieting – changing how we eat in order to improve how we look or how we feel. But changing how we eat in order to know God or to rightly keep a feast of the Church – this is foreign. Our first question is often, “How does that work?” For we live in a culture of utility – we want to know the use of things. Underneath the question of utility is the demand that something make sense to me, and that I be able to ultimately take charge of it, use it as I see fit and shape it according to my own desires. Perhaps the fast could be improved? When a modern Christian confronts the season of Lent – the question often becomes: “What do I want to give up for Lent?” The intention is good, but the question is wrong. Lent quickly becomes yet another life-choice, a consumer’s fast. The practice of the traditional fast has been greatly diminished over the past few centuries. The Catholic Church has modified its requirements and streamlined Lenten fasting (today it includes only abstaining from meat on the Fridays of Lent – which makes them similar to all the other Fridays of the year). The Protestant Churches that observe the season of Lent offer no formal guidelines for Lenten practice. The individual is left on their own. 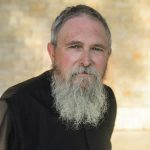 Orthodoxy continues to have in place the full traditional fast, which is frequently modified in its application (the “rules” themselves are generally recognized as written for monastics). It is essentially a vegan diet (no meat, fish, wine, dairy). Some limit the number of meals and their manner of cooking. Of course, having the fast in place and “keeping the fast” are two very different things. I know of no study on how Orthodox in the modern world actually fast. My pastoral experience tells me that people generally make a good effort. Does any of this matter? Why should Christians in the modern world concern themselves with a traditional practice? What is at stake in the modern world is our humanity. The notion that we are self-authenticating individuals is simply false. We obviously do not bring ourselves in existence – it is a gift. And the larger part of what constitutes our lives is simply a given – a gift. It is not always a gift that someone is happy with – they would like themselves to be other than they are. But the myth of the modern world is that we, in fact, do create ourselves and our lives – our identities are imagined to be of our own making. We are only who we choose to be. It is a myth that is extremely well-suited for undergirding a culture built on consumption. Identity can be had at a price. The wealthy have a far greater range of identities available to them – the poor are largely stuck with being who they really are. Thus, a beginning for a modern Lent is to repent from the modern world itself. By this, I mean renouncing the notion that you are a self-generated, self-authenticating individual. You are not defined by your choices and decisions, much less by your career and your shopping. You begin by acknowledging that God alone is Lord (and you are not). Your life has meaning and purpose only in relation to God. The most fundamental practice of such God-centered living is the giving of thanks. Renounce trying to improve yourself and become something. You are not a work in progress. If you are a work – then you are God’s work. “For we are His workmanship, created in Christ Jesus for good works, which God prepared beforehand that we should walk in” (Eph 2:10). Do not plan to have a “good Lent” or imagine what a “good Lent” would be. Give up judging – especially judging yourself. Get out of the center of your world. Lent is not about you. It is about Christ and His Pascha. Fast according to the Tradition instead of according to your own ideas and designs. This might be hard for some if they are not part of the traditional Church and thus have no fasting tradition. Most Catholics have differing rules for fasting than the Orthodox. If you’re Catholic, fast like a Catholic. Don’t admire other people’s fasting. If you’re Protestant but would like to live more traditionally, think about becoming Orthodox. Short of that, covenant with others (family, friends) to keep the traditional fast. Don’t be too strict or too lenient, and if possible keep the fast in a manner that is mutually agreed rather than privately designed. Be accountable but not guilty. Pray. Fasting without praying is called “the Fast of Demons,” because demons never eat, but they never pray. We fast as a means of drawing closer to God. Your fasting and your prayer should be balanced as much as possible. If you fast in a strict manner, then you should pray for extended periods. If you fast lightly, then your prayers may be lighter as well. The point is to be single – for prayer and fasting to be a single thing. To our prayer and fasting should be added mercy (giving stuff away, especially money). You cannot be too generous. Your mercy should be as invisible as possible to others, except in your kindness to all. Spend less, give away more. Eating, drinking, praying and generosity are very natural activities. Look at your life. How natural is your eating? Is your diet driven by manufactured, processed foods (especially as served in restaurants and fast food places)? These can be very inhuman ways of eating. Eating should take time. It is not a waste of time to spend as much as six hours in twenty-four preparing, sharing, eating and cleaning up. Even animals take time to eat. Entertain yourself less. 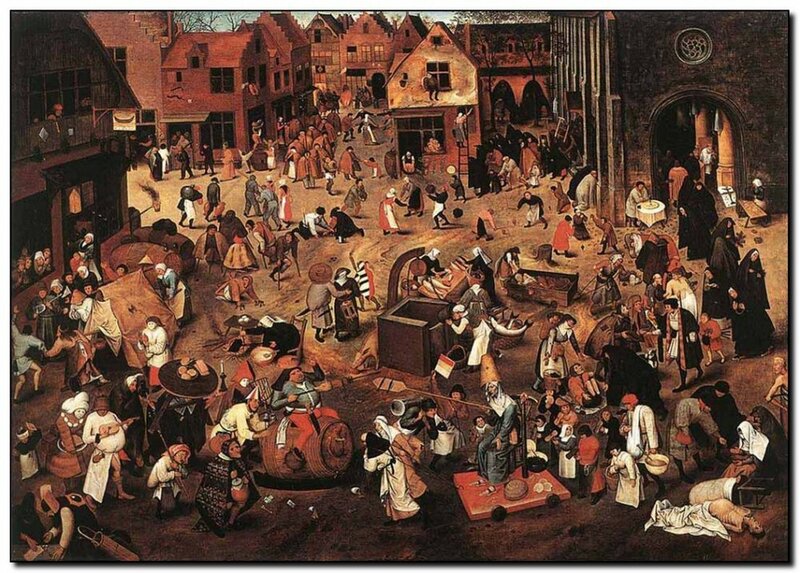 In traditional Orthodox lands, amusements are often given up during the Lenten period. This can be very difficult for modern people in that we live to consume and are thus caught in a cycle of pain and pleasure. Normal pleasures such as exercise or walking are not what I have in mind – although it strikes me as altogether modern that there should be businesses dedicated to helping us do something normal (like walking or exercising), such that even our normal activities become a commodity to consume. Fast from watching/reading the news and having/expressing opinions. The news is not presented in order to keep you informed. It is often inaccurate and serves the primary purpose of political propaganda and consumer frenzy. Neither are good for the soul. Opinions are deeply destructive to the soul’s health. Opinions are not properly considered, necessary beliefs. They are passions that pass themselves off as thoughts or beliefs. The need to express them reveals their passionate nature. I could well imagine that a modern person, reading through such a list, might feel overwhelmed and wonder what is left. What is left is being human. That so much in our lives is not particularly human but an ephemeral distraction goes far to explain much of our exhaustion and anxiety. There is no food for us in what is not human. Ho! Everyone who thirsts, Come to the waters; And you who have no money, Come, buy and eat. Yes, come, buy wine and milk Without money and without price. Why do you spend money for what is not bread, And your wages for what does not satisfy? Listen carefully to Me, and eat what is good, And let your soul delight itself in fatness (Isa 55:1-2). “Let your soul delight itself in fatness…” the irony of Lent. The fast and all things associated with it can quickly become problematic. Over the years I have abandoned all attempts to “understand” it. Jesus commands to fast but does not say how or why. In a culture in which fasting with prayer was common not much explanation was necessary I suspect. So for me, it comes down to obedience. Jesus tells us to do it, the Church says how and when. When I am disobedient, I suffer. The limits to which I am willing to suffer in disobedience frequently determine how I fast. I consulted once with a nutritionist and mentioned the fast in our conversation. Her advice was to not think of the fast as any different than any diet plan. That, I recognized as a temptation from the evil one and I at least rejected that. The fast is set apart and sets us apart. Thank you, Father. In our parish, this has been a difficult Fast for many of us. It is not the diet that is an issue but we are more and more aware of our passions and it seems there are many issues (family, friends, etc.) that are challenging us. I thank you for this reminder. Thank you for this encouragement during Great Lent, Fr. Stephen! I especially appreciate reading these words: “…Renounce trying to improve yourself and become something. You are not a work in progress. If you are a work – then you are God’s work. “For we are His workmanship, created in Christ Jesus for good works, which God prepared beforehand that we should walk in” (Eph 2:10). Should paste that on my mirror…. Thank you Father. I can’t be reminded enough. That: “Lent is not about you. It is about Christ and His Pascha…” is a great gem! Fasting is intimately connected with joy. Our most common deterrent is, funnily enough, not our voraciousness appetite or even our self-indulgence, but our fear… The proof of this is that many manage to diet with greater ease in order to acquire an attractive physique but are scared to “get out of the center of their world” by taking the plunge of ecclesial fasting. Of course, as with all ascetic actions, we must have the ease and the relaxed manner of a genuine spiritual nobility: we must have the liberty to break the fast when required and to double the fast when required too. Only one who can truly feast can truly fast, just as one who can fast can feast. Similarly only one who can really talk at length can keep silence most commendably and deservedly. Likewise one who has the ability to keep silent can commendably talk at length. Wonderfully informative and insightful post. Thank you! A very rich feast, Father, thank you! As always, a gem of an article…especially “Lent is not about you”. But it was “Fast according to the Tradition “ that caught my eye. I was born and raised in the US, in a Greek-American household, where my grandmothers (both Greek) fasted “according to the Tradition”. Although we lived in a very rural area, nowhere near a church, I remember that when Lent began, neither watched their soap operas and that both ate very little, mostly olives, lentil soup, some bread., and of course, fruit. My paternal grandmother used to tell us that she remembered that her mother and grandmother ate only antidoron and water for the entire Fast, and went to church every morning and every night. Talk about a a fast of the saints! But those were different times; food was scarce to begin with, so keeping the fast in the manner that they did, was indeed, a true fast. Living as I do now, in a traditional Orthodox country (Cyprus), I can honestly attest to the fact that even here, the international market and the internet has changed how we fast. It almost seems, with more and more ways to maintain the diet that the Fast requires, that to “fast according to the Tradition” is something that is being lost…like we are being tempted to say that we maintain the fast but have found new ways to ensure that our bellies are full. In line with the irony of the soul delighting in fatness/ fullness, I guess that the best way to approach how we eat during the Fast is to remember that less is more. Thanks Father Stephen for the reminders! I have also known the reality of such recent predecessors in Greece, who would fast as you described (only the bread of ‘antidoron’ on weekdays) with seeming ease. They also had the noble freedom to break the fast (partially, as is defined by the ‘economy’ of our tradition) whenever a visitor or some other occasion called for it, without anyone really noticing their eating habits. An interesting thing is that I have come across some of the new generation of eastern-influenced ‘spiritual-atheists’ (in Greece) who do total fasts of 78 hours (not even water) for other, quasi-yogic, reasons. They are very vocal and proud of it too and rather than being mocked by secularists they are admired, we see here a case of double standards. Wonderful blog entry, Fr. Stephen! A few points here that greatly need to be heard by us modern individuals. Please do make this a podcast episode as well, for a wider audience, if possible. Yes, that has also made its way here to Cyprus, unfortunately. But I really think some of these Yiayias (grandmothers) could give them a run for their money! The Yiayias, at least, are not vocal about their asceticism…but oh…when you talk to them and they start talking about the Saints, that is when you realize just how very much both the Saints and the Yiayias are truly alive to each other! May God grant us all the strength, stamina and abiding love of those Yiayias! Why is this so hard?? Why do I feel guilty? MamaV – giving birth to a child and giving yourself wholly to your child is an ascesis all its own. I believe that Fr. Stephen has written that no greater work can a woman do than raise and nurture her children. As he mentioned there is more than one way to fast (Isa.58). In the past I read Catholic literature. I like a word they use, “scrupulocity.” Reminds me of my Sikh aide. She was scrupulous in checking food labels. I’ve seen Orthodox do this (me early on). We can attempt to follow the letter of the law so that we forget the spirit…showing love, mercy, kindness, as in Isaiah. So, love that little baby. Rejoice in Christ’s great gift to you this lenten season, as I am sure you do. Thank you everyone for your kind words!! I know rationally that what you say is true, I just so often fall into the trap of comparing myself to all of my friends (none of whom gave birth on clean Monday). I tend to be scrupulous, as Dean mentioned. Being entirely unable to “do lent perfectly” is a gift from God… if I will recognize it as such. My dearest MamaV, by Hus richest mercies, God has overruled me and given you the perfect Lent. I pray that the Tgeotokos will be especially close to you as you share in a mystery that so filled with her heart! Pray for us! and truly, I can think of no greater repentance from the modern world than the God gifted and blessed sleep deprived – living for her child and giving of her very herself as nourishment – vigil of a mom to her newly born babe… you have a blessed blessed blessed Lent, my dear! Oh, watch! Now there will be a plethora of newborns during Lent. And there is no prescribed fast 9 months earlier to prevent it. All kidding aside: MamaV, blessed art thou for bringing new life into the world. Especially, when the world is opposed to any inconvenience to self-indulgence. For me Lent last year was interrupted by an emergency surgery with no enduring effects. Now this year, I am inundated with my mercilessness, which of course disturbs the Lord’s merciful cycle. Perhaps, I am being encouraged to greater alms-giving, as my dietary costs are reduced. You could listen to the recorded Psalms, together with your baby. What a wonderful way it would be for both of you to share that experience. 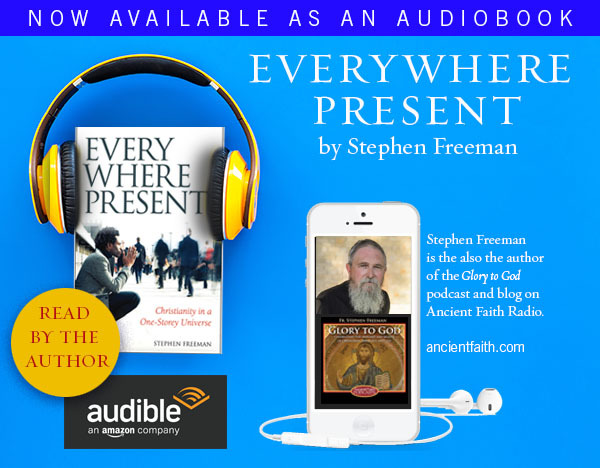 If you email me, I can share with you an Audible copy of “The Ancient Faith’s Psalter for Prayer”, read and chanted absolutely beautifully by Fr. John Oliver. Amazon is letting me share it with as many people as I want, apparently… It even worked to send it in a text message, and a friend could listen on his phone..
Congratulations on your new baby! What a wonderful and special time to be with your baby so exclusively..
We are all called to give more alms with the money we save on food. Somehow the alms-giving has been practically removed from the list of good deeds/expectations in Lent (along with manual labor, which apparently was on the list too!). I know I owe all my generous donors (especially from this blog) an update, but for now let me tell you your gifts were very gratefully received and went to most real and immediate needs of the nuns and the orphans! I just recently gave birth to a little one too, and God comforted me in my similar feelings through one of my favorite Saints, St. Iakovos of Evia. St. Iakovos’ words have changed my feelings in this way, as I have learned that my prostrations and my prayer ropes are my children. I thank God everyday that He made me to be a mother of them. The biography of Saint Iakovos of Evia is one of my favorite. Wow. That was one of the most encouraging things I have ever read. St Iakovos has spoken so sweetly and gently! Also I ought to mention that with my sweet husband trucking our other five children off to Lenten services all the time, I have had lots of time to chant the Psalter and pray akathists. That has certainly been a blessing, and very unique to this particular time. Than you, Father. I will do what I can. I have been largely quiet for the past few days. I have been in Orlando, FL, doing a clergy and parish retreat. Next weekend I will also be leading a retreat and traveling. I’m reading the comments, but I’m not always near my keyboard to respond. Responding by phone is too tedious. Many prayers for you all! Esmee you picked the best book on Saint Iakovos. I met professor Papadopoulos a few times in Docheiariou monastery in Mount Athos, where his spiritual father elder Grigorios was based and his son, one of the hieromonks still is. Himself, became monk Gerasimos shortly before his death. He was a captivating theologian, prolific writer and from the many books that he wrote, he gave me the one of Saint Iakovos as a present. He new the Saint well, experienced the miracles and spoke about him as someone who knew him well. In his book Cooked: A Natural History of Transformation, journalist Michael Pollan states that the time spent by the average American family in daily food preparation is 27 minutes, plus 4 minutes for clean up, half of what it was in 1963. That’s a far cry from the 6 hours you mention. I suspect it’s not so much that we don’t care to eat good food, but that we’ve largely forgotten how to make it or don’t have the time in our over-scheduled lives and have outsourced the task to corporations that are happy to help. Help, that is, in the sense of adding fiber to Splenda. I’m learning to make sourdough bread, which up until the popular use of commercial yeast about 100 years ago, was the normal way of making bread. I’ve had some spectacular failures, but when I get it right, it’s so good. Now I understand how those monks I’ve read about who survive eating only bread during Lent can manage it. You can make a meal of this stuff. Though it takes two or three days to make sourdough bread, I spend very little time doing anything beyond occasionally checking in to see what the bacteria and natural yeasts are doing and intervening a few times during the process. It feels like a good use of my time. So I appreciate your comment about the inherint humanity and goodness of cooking and eating food. Nicholaos – Wonderful story, thank you for sharing. It was recommended to me by Nun Monica from Holy Assumption Monastery in Calistoga, and it was recommended to her by Abbess Susanna of Our Lady of Kazan Skete in Santa Rosa. The hardships of his life, in combination with his intense love of God from earliest childhood, really made an impression on me. One thing I remember in particular is that he had only one small paper icon throughout all his growing up years, while I have a wall of Icons and and still cannot love God the way I wish! I believe Fr. Stephen wrote a post or comment not long ago about how we Americans (steeped in Modernity as we are) really transfer our consumerism into our Orthodox faith. We love to buy Icons, but our actual spiritual life is about 1% of that compared to someone like Saint Iakavos. He was just officially sanctified a few months ago. Glory to God for All Things! Thank you fr. Stephan – another wonderful post drenched in Wisdom! I really enjoy diving out the pearls hidden in your writings. This gem has really got me mediating..”There is no food for us in what is not human.” and “Let your soul delight itself in fatness…” the irony of Lent. I tent to forget that the soul also eats and drinks, this post has opened that realm up in a new and delightful way – thank you. I hope you write on this truth in more detail sometime. Yeah Dean…fatness of the soul, filled with The Word, is that which we feast on, even during a fast. Indeed one of those ironic sayings. The sign in the dentist office…funny! Where do you get your information on making sourdough bread? I would love to look into making that! If you google sourdough bread, you’ll find more information than you could ever read. It can be overwhelming, so it may be best to pick one recipe/method and stick with it until you learn the ropes. I currently use this recipe: https://zerowastechef.com/2015/09/17/sourdough-bread/ because it uses almost all whole grains. Also at the website is a recipe for making a starter. But really, if you can find someone to share some of their starter with you, use that. It gets you up and running and baking. The recipe above is an adaptation of the recipe in the book I referenced, Cooked: A Natural History of Transformation . It’s valuable if you’re interested in the history and science involved in sourdough, as well as providing an eye-opening look at industrial milling and baking. The book has been made into a four-part documentary available on Netflix. I hope it goes well for you! All you really need is a digital scale, a Dutch oven (I think Lodge’s cast iron one is the least expensive) and a razor blade stuck onto the end of a coffee stirring stick. Wow. So much good stuff in this post! Thank you Father! I meant to add…..thank you Michael for your comment (the first one on this post). I found it very helpful.